The government budget should be the financial mirror of society's choices. Yet most people view budgeting as the epitome of eye-glazing subjects, rarely explained in a way that is understandable to the non-specialist and too often presented without adequate consideration of a country’s governance and institutional capacity. Government Budgeting and Expenditure Management fills a gap in the literature to redress these failings and does so in comparative international perspective. This book provides a comprehensive but pithy and easy-to-understand treatment of public financial management, taking into account a variety of special issues including budgeting in post-conflict situations, at subnational government levels, for military/security expenditures, and in countries with large extractive revenues. Distilling the lessons of budgeting reform in countries at different levels of income and administrative capacity, each chapter gradually progresses from the basic principles to the more technical aspects and then on to implementation issues, using concrete examples and illustrations from around the globe. 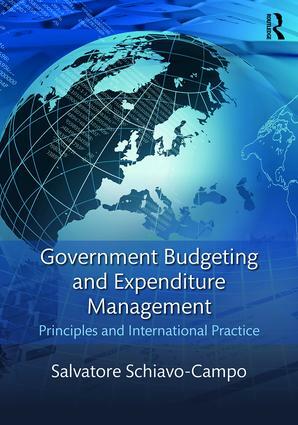 Government Budgeting and Expenditure Management is ideally suited as the primary text for advanced undergraduate or graduate courses in government budgeting or public financial management, or as a supplementary text for courses in public finance, public economics, economic development, public administration or comparative politics. With its attention to practical implementation aspects, the book will also be of direct interest to practitioners, policy-makers, and government employee training organizations.